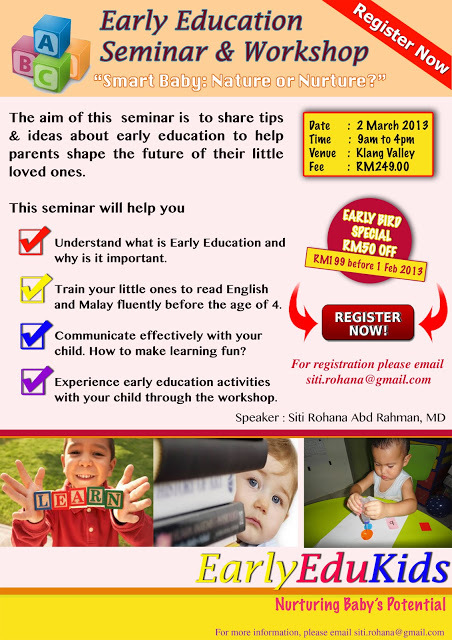 Still remember my first ever guest blogger project?Dr Siti Rohana aka mama ct, will conduct one day seminar and workshop about Early Education. Great job ct! *kagum betul dgn semangat kental wanita ini dalam pendidikan awal anak* One day seminar will be happened early of March 2013. Special price for early bird!! Alhamdulillah, I've booked a seat for me. Hopefully to absorb as much I can from this wonderful lady. 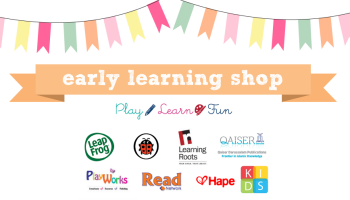 For more info, check out this link! Or u can drop comment down here, InsyaAllah will try to assist! ps: pray for a smooth journey ct. All the best! berminat ye..dah email to pn siti..
btw, nk bawak baby masa morning session ok tak? Dah join. See ya soon..